Denman Home and Garden Tour—set for May 9 and 10— showcases the unique features of Island living. One day, it dawned on Weston that he was, quite literally, sitting on a potential gold mine—his blue jeans! Denim fabric is made of cotton, which is a 100 per cent natural and completely biodegradable product. 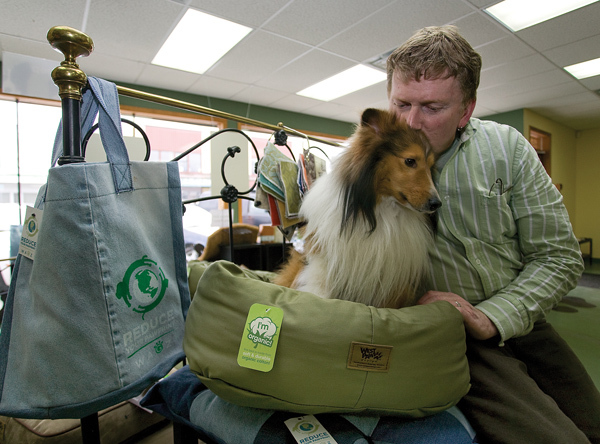 And, since old blue jeans are a finished product, there would be no need to use any chemicals to “manufacture” the “raw materials” to make a line of reusable bags for use and sale at Wagz holistic and raw pet food and accessories store in Courtenay. Weston knew that many people have old jeans they no longer wear but simply haven’t gotten around to recycling. Perhaps the “spare” jeans are tattered and worn. Maybe they are part of someone’s “One day I’m going to lose enough weight to fit in them again” wardrobe. Perhaps they’re simply out of style. Whatever the reason, he suspected that there could potentially be hundreds of used blue jeans stacked in closets in the Comox Valley. Susan Bunn, executive director of the Courtenay-based Beaufort Association for the Mentally Handicapped, was thrilled with the concept. “Wagz Bagz was a project I knew our people would really enjoy,” she says. The Beaufort Association’s Quest program offers a variety of services focusing on personal development and community involvement opportunities for adults with mental and physical challenges. Sewing facilities were already in place, so the jean bag idea was a perfect fit. Considering that Quest is all about empowering people with developmental and other ability challenges, the participants are not volunteers. They are paid for their work. (They are, however, assisted by a team of several volunteers from the community.) Quest provides the participants with a place to work on various projects, then guides and facilitates their activities with the appropriate training, equipment and support. Recognizing the vital contribution that the Quest participants would be making for this project, the people at WAGZ made the decision to donate all proceeds from the sale of Wagz Bagz directly back to Beaufort. Quest participants Brian, Danya, Leona, John, Rae, Mary, Deb, Dave and others would look after the majority of the cutting, sewing, serging, silk screening, ironing and quality control processes used in constructing Wagz Bagz. Andy McDougall, silk screen guru of the Comox Valley, agreed to provide technical assistance with the intricate step of silk screening the fabric. A two-color silk screen logo was designed and would be applied using non-toxic, biodegradable, water-based inks. Weston says that the finished product is carefully constructed and expertly sewn to last for many years. The team at Beaufort has set up a production process that ensures that no scraps of cloth, seams, zippers or rivets are wasted.